Maritime great power politics is back and here to stay. Hence, EU needs to adapt and rediscover geopolitics. Although hard power matters most, Europe’s naval decline is likely to continue: Less money, less navies. To be nevertheless a serious player, EU has to adapt a smart power approach. Most important is that EU says what it does and does what it says. 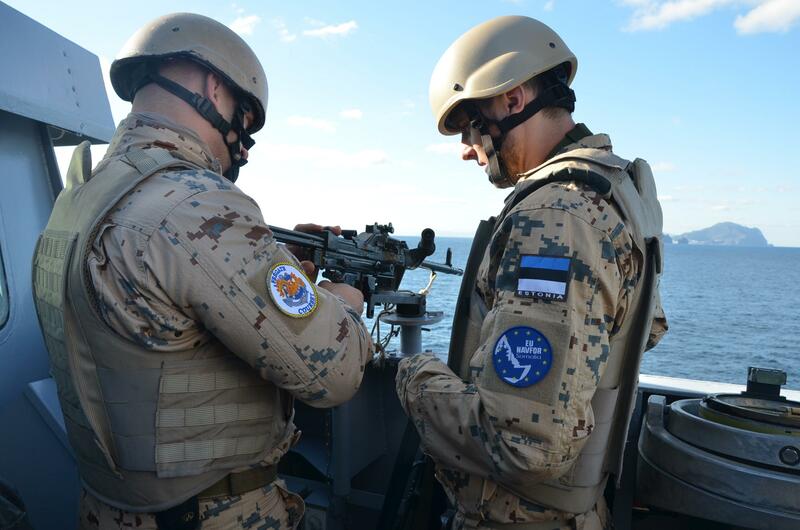 EU NAVFOR: Soldiers from different branches of the Estonian Armed Forces, are deployed on board the FS Courbet, following an intensive 4 months of training in their home country. This training was followed by specialised exercises together with the French crew on board the FS Courbet to perfect the VPD’s procedures for protecting a vessel from pirate attacks (2 February 2013). The European Council’s December session on security policy offers only one remarkable result: In June 2014, EU will endorse a new Maritime Security Strategy (EMSS). After years of economic crisis, geopolitical decline and military constraints, an EMSS could give EU a new push to adapt to the evolving security environment. Such a push is more than necessary. Ten years after the European Security Strategy (ESS), Europe drifted from large ambitious into the strategic no man’s land: Soft power becomes more and more irrelevant, harsh great power competitions and geopolitics are back on the stage – just look at the Middle East and East Asia. In consequence, neither is anybody talking about a more secure Europe nor about EU building a better world. However, in the maritime domain Europe could come back on track. Therefore, EMSS must address three key points. First, it has to define Europe’s strategic-maritime aims and set out the means to implement them. Second, due to the capabilities, there has to be a clear work-sharing with NATO, because the Alliance is much stronger in maritime security than EU. Third, EMSS must outline how EU wants to adapt to a geopolitical/-strategic environment that will not only develop to Europe’s disadvantage, but also to the advantage of other powers. In the EMSS’ development, there is no need for a long debate about security challenges, risks and threats, because the problems are well known: Terrorism, piracy, proliferation, organized crime, energy security, choke points, critical infrastructure, disaster relief and so forth. Not war-fighting or deterrence, but rather “Military operations other than war” (MOOTW) are likely to dominate the operational agenda. What changed, in contrast to ESS 2003, are not the security challenges, risks and threats, but rather the players and theaters. As the EMSS is about “security”, the Baltic and the North Sea do not matter (when Russia tries to provoke, so what?). These are NATO/EU inland-seas and, therefore, only subject to regular politics and not to military considerations. 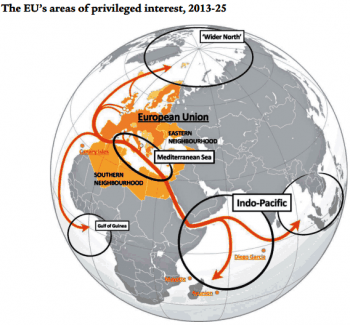 What should concern Europe, are the Arctic, the Indo-Pacific and primarily the Mediterranean. The Gulf of Guinea is an area of operational, but not of strategic concern. Present piracy can be tackled by regional actors with international support. The Arctic’s emerging geopolitical relevance is stressed by the relatively high number of applicants for observer status in the Arctic Council. In May 2013, EU suffered a serious defeat, as Brussels’ application was rejected, while China, India, Italy, Japan, South Korea and even Singapore became observers. For EMSS it has therefore to be said, that there is no military role for EU in the High North. Sweden and Finland are Arctic Council members, but without direct access to the Arctic waters. What matters for EU are trade routes and resources. Thus, an EMSS should define how EU can contribute to safe and secure Arctic shipping lanes and how Europe’s resource interests can be preserved. After the rejection, however, it is clear that EU will not be one of the major players in the High North. Instead, other theaters should receive more attention. Source: EUISS Report No. 16, p. 17. The Indo-Pacific should be of great concern for EU. Due to China’s and India’s naval rise along with the growing seaborne trade, Indian and Pacific Ocean have to be seen as one theater. Moreover, there is an Emerging Asian Power Web made by bi-, tri- and multilateral maritime security partnerships among Indo-Pacific states. EU’s interests in Indo-Pacific security are primarily motivated by economics. In 2012, the total value of goods shipped from Europe to Asia was 816 billion Euros (Jonathan Holslag, “The Eurasian Sea“, Survival 55, No. 4, 01 August 2013, p. 157). While EU can and should play a role in the Indian Ocean, the Union will hardly become relevant East of Malacca Strait. EU has been rejected three times as an observer at the East Asia Summit. Thus, an EMSS has to put a strong emphasis on the Indian Ocean and the Persian Gulf, but it also has to accept that EU will remain irrelevant between Singapore and Vladivostok. Only France and Britain could make themselves relevant in maritime East Asia. However, while budgetary under constraints, they will only choose to go there in case of a major incident. During its disaster relief operation on the Philippines, the Royal Navy demonstrated that the UK is still capable of acting East of Malacca. However, the British posture also showed the Royal Navy’s limits. Moreover, it can be ruled out that Paris and London develop some kind of EU maritime security altruism and make an expeditionary EU presence a national priority. Instead, both will allocate their expensive warships to operations concerning their national interests, but not to EU (or NATO and UN) tasks. Hence, EMSS has to outline what European states want to do together in the Indo-Pacific and what not. It does not make any sense to write high expeditionary ambitions into a strategy, when it is clear from the beginning that those who have the means for implementing have no interest in doing so. Less can be more. This means the EMSS should contain realistic and credible ambitions in the Indo-Pacific, making the EU an actor who says what it does, and does what it says. Otherwise, EU is doomed to irrelevance East of Suez. In addition, EU has to withstand the seduction of a new free-riding with maritime stability and security provided by Asian powers. There is no guarantee that those powers will remain friendly to European interests. Most important for EU is the Mediterranean. Not only by the refugee issue, but also by the new great power plays in the Eastern Mediterranean. Russia has returned as a serious naval actor with its largest expeditionary operation since 1991. New conflicts about offshore gas will emerge. Moreover, the growing instability in North Africa from Tunisia to the Suez-Canal calls for EU action. Therefore, Brussels’ main challenge will be to define in the EMSS, how EU wants to cooperate further will its Mediterranean partners. In addition, EMSS has to say how EU aims to contribute from the maritime domain to stability ashore. Although terrorism, proliferation, human trafficking, illegal migration and organized crime are subject to EU’s maritime agenda, the solutions are to be found on land, not on the waters. 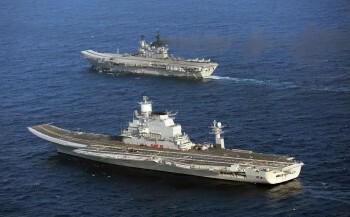 Indian Navy show its two carriers Viramaditya (foreground) and Viraat. After the USSR’s collapse, only the United States and EU countries, in particular Britain and France, possessed the monopoly on long-range power projection. Until present, there is no other country, which is be able to go for Falklands-War-Style missions. This is going to change. While France and Britain are struggling to keep their capabilities alive, especially China, Russia and India are preparing themselves for expeditionary missions. In 2013, we have seen Russia’s largest expeditionary deployment in the Mediterranean since 1991. In terms of expeditionary power projection, Australia, Brazil, Japan and South Korea could become more capable players, if their governments decide to pursue that track. Rather than focusing on security challenges, EMSS has to address how Europe wants to deal with emerging naval powers. Of course, cooperation for promoting common interests, like safe and secure sea-lanes or mutual trust-building, should be a top priority. However, Brussels tends to see the world too much through pink glasses, where the world becomes good by itself as long as there are talks about multilateralism and global governance. Instead, the maritime environment can remain friendly to EU interest, but due to great power politics this cannot be taken for granted. Therefore, EMSS has to address how EU will react (it will not take the initiative) in case of fundamental state-driven changes to a maritime environment, which is hostile to European interests. Thus, advancing partnerships with like-minded democracies like India, Japan, Australia and South Korea has to be an EMSS priority. Potential partners are also Singapore, Indonesia and New Zealand. Cooperation with China is likely to become much more difficult, because recent Chinese actions (ADIZ) showed that Beijing’s approach continues to become much more assertive. Defining realistic and achievable aims for EU is that simple: Stability, security, safety and prosperity. Stability is the most important of all aims. It enables the flow of trade and the opportunities of doing non-hard power related politics. However, stability requires security and safety. Those three lead to the fourth aim: Prosperity by the maritime domain as an area, which provides trade lanes and resources. For EU, it does not matter who owns what. However, Europe’s interest is the absence of conflict. Hence, an EMSS has to outline an increased portfolio of cooperation and trust-building programs. Queen Elizabeth class aircarft carrier (Drawings by SuricataFX / Wikipedia, Creative Commons Attribution-Share Alike 3.0 Unported). Europe’s soft- and hard-power continue to suffer seriously from the monetary and economic crisis. To be effective and efficient, EU has to follow an approach of smart power. The latter means the combination of civilian and military means. However, as navies are costly, EU’s focus should generally be on civilian capabilities, where necessary accompanied by military assets. In case of hard power, there will be no European comeback. Recent celebrations about countries leaving the rescue mechanisms ignore, that the European Stability Mechanism and the European Financial Stability Facility became irrelevant, because there is a new unofficial rescue mechanism called European Central Bank (which does not include any submission to Troika obligations). The crisis has been managed, but it has not been solved. As the debt track is not left, Europe’s armed forces will face further cuts. However, naval hard power matters most, because that is what you need to pursue your interests on the high seas. There is no soft power equivalent. Hence, it is important for Europe that the Royal Navy commissions both new carriers and that France, Italy and Spain preserve their flattops. Moreover, with an eye on Mediterranean and Indo-Pacific theaters, LHD and LPD will be needed for MOOTW. Of course, this requires a balanced fleet with destroyers, frigates and submarines. For long-range power projection, the British and French SSN remain very relevant. Moreover, although extremely unpopular, Europe has to maintain a credible sea-based nuclear deterrent. That is also, why Britain should throw all alternatives in the bin and build four new SSBN. For implementing maritime smart power, coast guard vessels and patrol aircraft are needed, along with partnership teams on land. Especially in the Mediterranean, police enforcement capabilities are necessary. Challenges like migration and organized crime are not military issues. Moreover, research ships and new policies for fishing and energy are of great concern. NATO vs. EU? How to deal with the US? Much has been said here about emerging naval powers, while the world’s largest seapower – still the US – has not been discussed, yet. Whatever happens, America will remain Europe’s most important naval partner, based on common interests and capabilities. That is why NATO has a great maritime relevance, because it links the US Navy to Europe. As the EU does not have any naval links with US yet, EMSS has to clarify the relationship between EU, NATO and the US. What we do not need is a beauty contest, but what we do need is a clearly defined and coordinated work-sharing. There was never a real reason why both, NATO and EU, had to have maritime operations in the Gulf of Aden. Both organizations wanted to be part of the international maritime beauty contest. In the future, however, Europe cannot afford two organizations doing the same. Therefore, the work-sharing between EU and NATO should look like this: While EU is good at civilian missions and smart power, NATO has decades-old naval hard power experience. Hence, the modus vivendi should be that EU is doing the softer and civilian tasks, while NATO does the hard power jobs; Europe becomes less capable in hard power anyway and only NATO provides access to the needed US assets (and maybe British assets, too, if the UK leaves EU). Moreover, it could be elaborated, if EU could get access to NATO’s Standing Maritime Groups. However, NATO’s real maritime worth is that the alliance links Britain, Canada, Turkey and Norway to European security. The UK is drifting apart from EU, but the Royal Navy will remain the most capable of all European navies. Turkey in the Mediterranean, Canada and Norway in Arctic are indispensable partners. All four countries continue to in their naval capabilities. In the US, NATO and EU triangle, EMSS has to address who does what and where. While US will carry most of the maritime burdens in the Indo-Pacific, also relying on coalitions of the willing, NATO’s concern should be hard power missions in the Mediterranean and Indian Ocean. In such a work-sharing, EU’s job would be to tackle the civilian and softer issues in the Mediterranean and the Indian Ocean; maybe in the South Atlantic, too. Chinese navy frigate ‘Yancheng’ is seen at Limassol port in Cyprus, 04 January 2014, as part of a mission to remove Syria’s chemical weapons. 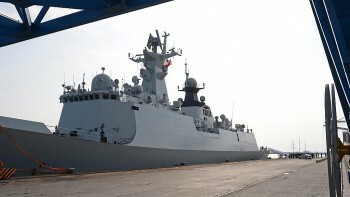 To secure the destruction of Syria’s chemical weapons, China’s navy is now operating from Cyprus, an EU member state, in the Eastern Mediterranean. Yes, it is only access to a port for supplies and it is only on a tactical level. Nevertheless, it is remarkable, while EU is not taken serious in Asia, China shows the flag in European homewaters. Never before has Non-Western power operated from an EU member state. In addition, in 2012, Japan’s premier minister Shinzo Abe invited Britain and France to come back to the Asian maritime security theater. Nine years after the ESS’ endorsement, it was quite humiliating for EU that not the Union herself, but rather two nation states have been addressed in such a way. Obviously, EU was not taken for serious in terms of hard power. Five megatrends will define the decades to come: (1) digitalization; (2) competition for resources; (3) demographic changes; (4) economic globalization; (5) economic power shifts. Due Europe’s economic and demographic problems, European (maritime) decline is real and it is likely to remain so. Until 2030, competition for resources and economic growth will have increased the global sea-lanes’ importance, foremost in the Indo-Pacific. Emerging relevance of navies will go along with that. Moreover, 2030 is a point of time, where China, India and Russia (and maybe others) will operate navies capable of medium and long-range power projection. China then could posses the capabilities to fight (and win) Falklands-Style-Wars. Economically, China will have surpassed the US the world’s largest economy and European economies will have dropped back in the global economic hierarchy. The consequence will be that Europe will not able anymore to conduct operations like Libya 2011. 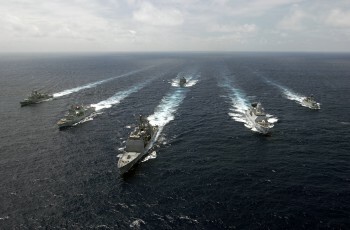 Moreover, European power projection will be balanced by the emerging naval power of others. Thus, it essential that EU enhances its partnerships with the US and NATO and, moreover, creates new partnerships with like-minded democracies, in particular India. Digitalization and robotics will lead to the fact that coming generations of naval systems can do even more than today, however, will be even more complex and therefore more expensive in procurement and maintenance. Europe’s budgetary situation will make the joint development, procurement and operation of new naval system a necessity. If this does not happen, Europe will simple disappear from the maritime domain as a serious, capable actor. In addition, it is likely that emerging navies, in particular China, will have the financial means to effort new high-end warfare assets, which will negatively affect Europe’s power. Standing NATO Maritime Group 1 (Photo: Mass Communication Specialist 3rd Class Vincent J. Street, 13.08.2007). With France on the march into an even worse economic mess, EU’s maritime power projection will largely depend on Britain – though the UK remains an EU member. Britain’s coming carriers and other high-end warfare capabilties (SSN, SSBN, Type 26 frigates) will be critical for Europe to be capable and taken serious in international maritime power politics. In this regard, the worst that could happen is that London decides to sell the second carrier to an emerging navy (e.g. Brazil). For the maritime balance of power, the second carrier must remain British (or European in some way) or, if it is sold, it has to be given to a like-minded country (e.g. Japan or Australia). After 2030, China likely and India maybe could reach the naval power status of the Soviet Union in the 1980s. This means the capability of global power projection and the ability to conduct at least one high-intensity operation. We will see scenarios where emerging navies conduct expeditionary power projection operations, while Europe will be incapable of doing anything, though there is no reversal of current trends. EU as a capable global, geostrategic and maritime security player is hardly imaginable for the decades to come. Hence, even not a popular idea, Europeans will have to re-discover the transatlantic partnership and NATO – a maritime alliance by nature. No matter how far Asian navies rise, the US Navy will remain the most capable of all and it will further dominate, although more and more challenged, the international maritime order. Europe in decline is well advised to seek close cooperation with the US, because America is likely to recover through the Shale Gas boom. For EMSS’ implementation, preserving and renewing capabilities is essential. Countries like Germany, Denmark, the Netherlands and Poland in the North and Portugal, Spain and Italy in the South have to elaborate new mechanisms to integrate their navies. Jointly operated LPDs or submarines could be a start. Joint task groups out of coast guards, police services, technical and environmental experts (and others) are a necessity. Whatever is agreed in EMSS: As much as decisions matter, it matters that words are followed by actions. In a time of new maritime great power politics, Europe must say what it does and do what it says. Otherwise, EU will not be taken serious and the EMSS can just be dumped in the bin. The Center for International Maritime Security (CIMSEC) is a non-profit, non-partisan think tank. It was formed in 2012 to bring together forward-thinkers from a variety of fields to examine the capabilities, threats, hotspots, and opportunities for security in the maritime domain. Check out the NextWar blog to join the discussion. CIMSEC encourages a diversity of views and is currently accepting membership applications here. This entry was posted in English, Felix F. Seidler, International, Sea Powers, Security Policy.